It’s time for the two most insular tech companies in the world to come together at last! That is, it’s time for Nintendo to make a game for Apple’s iPhone. There has to be a few million people out there who would pay $3 to $5 for one of these games — or $5 to $10 for both of them (assuming they’re good). This should generate enough revenue to make the porting process profitable. The world’s most fun video game company could get a taste of the world’s hottest gaming platform. It could do this without losing face, and without looking nervous or vulnerable. Nintendo wouldn’t be sacrificing any of its current hits — just a couple 20-year-old games. It would have an inside look at how the iPhone gaming ecosystem works — how often people play, what they do, etc., which could potentially help improve its own platforms. And it would have a better understanding of what the future might look like, if maybe — just maybe — the iPhone and other mobile gaming platforms do to the DS what the iPod did to the Sony Discman. Nintendo may laugh off the threat of iPhone gaming, but it’s real. 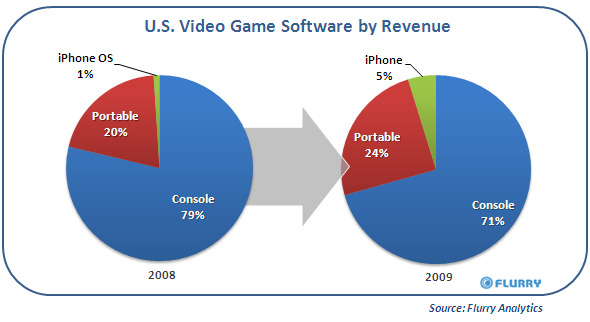 Mobile analytics firm Flurry estimates that the iPhone OS captured 5% of U.S. video game software revenue in 2009, up sharply from 1% in 2008. Meanwhile, portable gaming captured 24% of U.S. game software revenue in 2009, up from 20% in 2008. So while both areas gained roughly the same amount of dollars — at the expense of consoles — the iPhone grew much faster in relative terms. It’s easy to see how iPhone and other mobile platforms could take a much bigger chunk out of the market in the next few years. So far, Nintendo’s strategy seems to be to continue its DS series — its latest “3DS” will feature 3D gaming, reportedly without 3D glasses. Meanwhile, Sony is going to make a PlayStation phone, in an effort to compete directly with the iPhone and other smartphone platforms. Neither is doing anything for the iPhone OS so far, as far as we can tell. It’s possible, of course, that Nintendo and/or Sony will be able to slow their disruption. Maybe the Nintendo 3DS will be absolutely amazing, and will revolutionise portable gaming. Maybe both portable formats — DS and smartphone — will just continue to take share away from the living room consoles. But it’s equally likely that the iPhone and other smartphone platforms will eventually chip away at the DS and PSP. And then Nintendo will be in a tougher place than it’s in today. So while the future is still unknown, how about a little experiment? 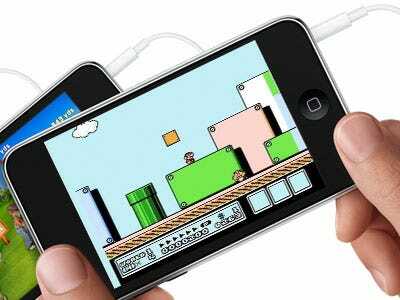 Let’s see some Super Mario Bros. action for the iPhone this year, Nintendo.